Ace Plastic Pipe Wrap intumescent system is a dry, flexible intumescent film wrap to be wrapped around plastic penetrating service pipes within the annular space between the civil opening of a wall/floor crossing in a building structure and the through penetrating plastic pipe. In case of fire, the wrapped intumescent film expands multiple times to seal the passage inside the plastic pipe as well as to seal the gap around the pipe and the civil opening structure. Wrapped layers are generally just sufficient to close the through gaps left between the pipe outer surface and the civil opening inner sides if it stays in place unaffected and unmoved. In case air tight seal in normal conditions is expected, the smallest of the gaps can be filled using Ace Mastick Sealant around the plastic pipe to extend to the civil opening, covering the small annular space left between the wrapping and the civil opening. The system can be installed for various standard plastic pipe sizes of nominal diameter like 1”, 2”, 3”, 4”, 6”& 8”. The product is tested as per ASTM E 814 & UL 1479. 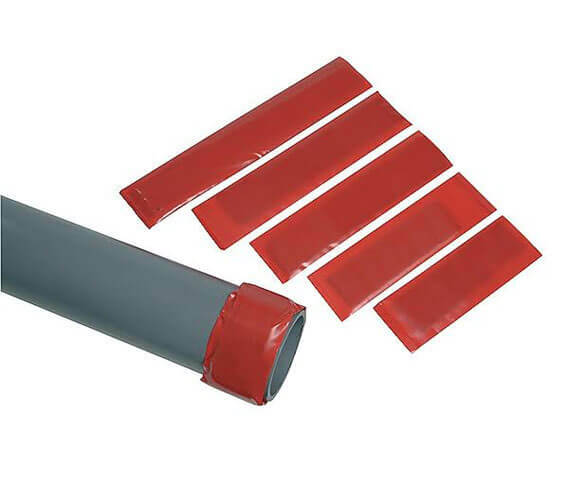 The flexible film in the form of a ready wrap around the pipe is wrapped in 1 to 2 layers . The film is generally 2.5 mm to 3 mm thick in a width of maximum 6”. It can be cut to required width at site to suit the location. Can seal almost all plastic pipe materials like HDPE,PVC, UPVC, CPVC, PVDF, ABS etc.